"A Star in the Sky" is now in the top stage. The top has been set aside and "Sunday Morning" is now the focus. The quilt was layered up last month. 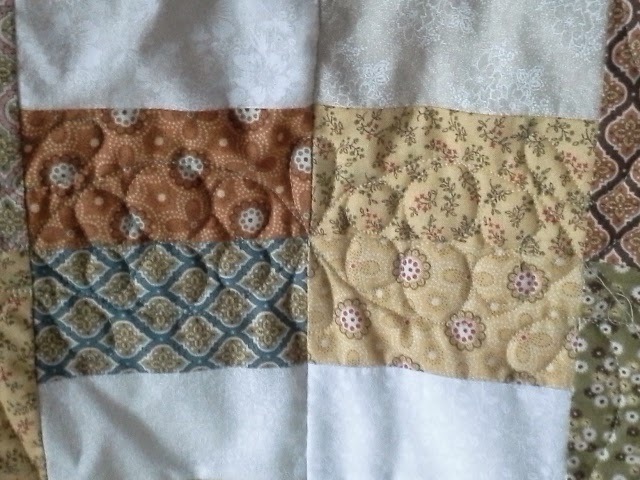 Yesterday the quilting was started. It always takes some time for the quilt to talk when quilting is the topic. 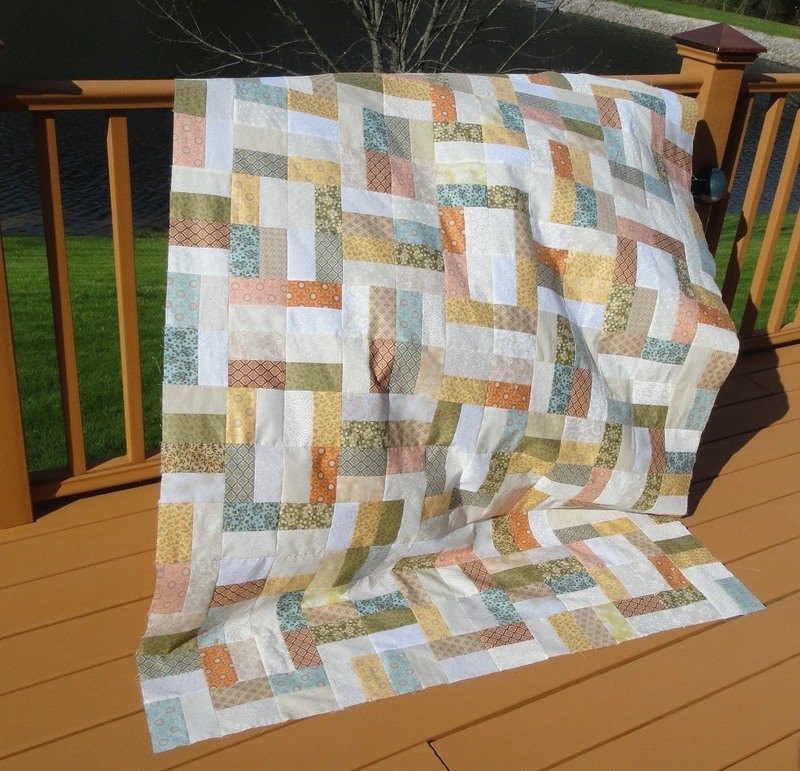 The quilting chosen came from a recent library check out. The library is a great source for both inspiration and knowledge. 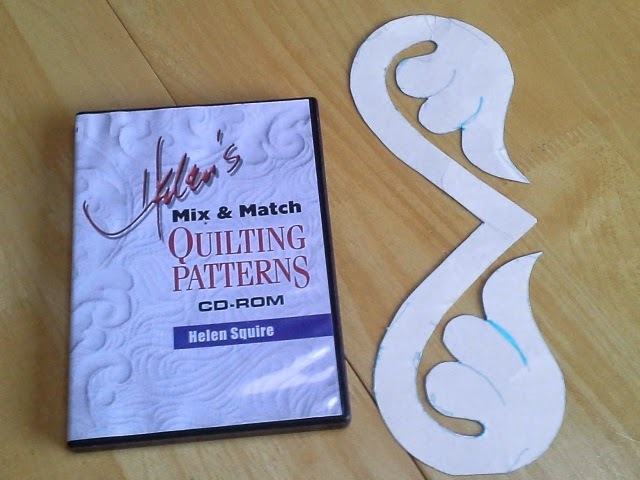 This CD-ROM "Helen's Mix & Match Quilting Patterns" has lots of great shapes. You can see the shape chosen. There are 5 or 6 different sizes of each shape that can be printed out. Traced onto card stock this can be flipped, mirrored and used partially in the areas needed. Here you can see that the shape is mirrored and a simple tic-tac-toe pattern connects the 2 patterns together. Here is the part that connects the two units together on the outside of the "block". A drink coaster worked great for the arches and a few circles and teardrops fill the space nicely. After setting this aside for a few weeks, it is time to get cracking and finish something. 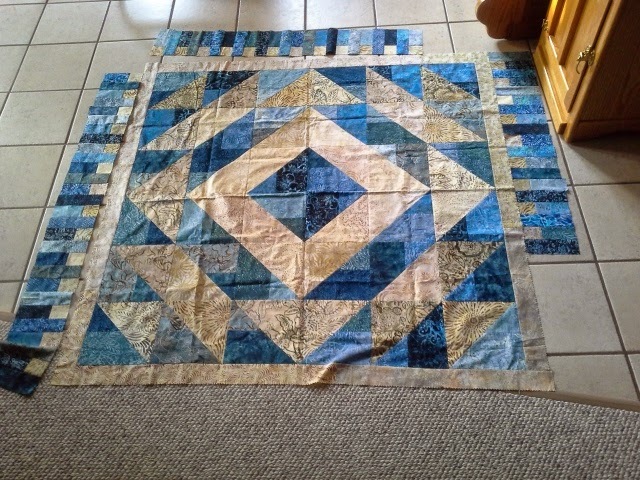 I also love how the quilting is going to be even across the space without heavy thread build up in areas. This area above is the most dense area. It won't feel like you are sitting on a rock due to the quilting and seams. Go check out what others are working on....Judy L. has the list. It was time to set down and figure out the corners of A Star in the Sky. Yep…figured it out. The 2 1/2” strips making up the border came out evenly but with 28 strips…one side had a strip with a white end and the other side a solid strip. Corners…ugh. I decided to have the corners be the same so one side has solid stripes with the white four patch touching the inner border. The other side has the sides ending in the stripe ending with a light square. The four patch in the corner is on the outside. If it was next to the inner border it would get lost. Didn’t turn out too bad. The colors look so much better outside in the fall sun. 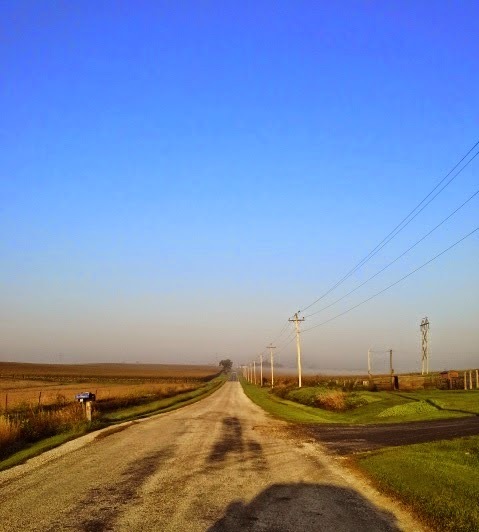 Morning in corn country. This wasn’t always beautiful in my mind. It took a few years being SURROUNDED by corn to appreciate the beauty. Our house has been busy. We have tackled sickness, taken vacations, moved children and had visitors. The garden produced great this year, leading to canning and freezing. I have managed to sew and keep up on blogs. The latest project is form fabric DH brough back from a trip to Chicago. These fabrics were set aside while working on Batik Brown Quilt. These didn't quite fit into a quilt headed to California with a new college man. 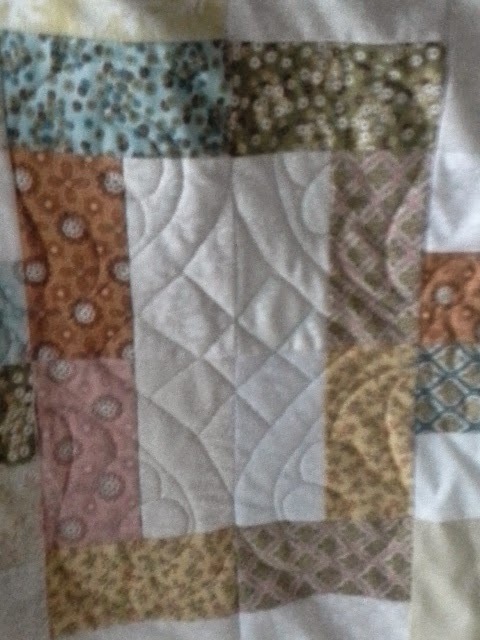 This quilt is made from a cake layer and is based on the Moda Bake Shop Anasazi Medallion Quilt.